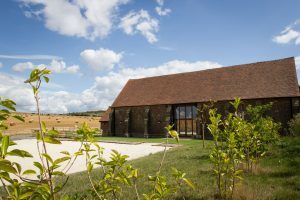 Seated the heart of the South Downs National Park, Long Furlong Barn provides an idyllic and versatile setting for civil ceremonies and wedding receptions. 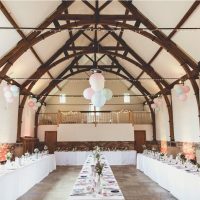 With a fascinating history stretching back to 1880, the Grade 2 listed tithe barn has been sensitively restored to provide a stunning venue for up to 150 guests. Situated only four miles from Worthing and close to Clapham it is also easily accessible from London, Brighton and Southampton. Ideal for larger celebrations, the Granary combines beautiful traditional architecture with modern amenities. 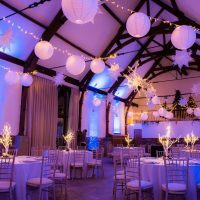 Catering for up to 150 guests, the barn boasts underfloor heating, colour changing lighting, HD projector and high-quality sound system. The wooden beamed vaulted ceiling and neutral décor make it romantic backdrop that is easily decorated to suit your scheme. Immaculately restored, the Cart Shed provides an elegant and naturally lit setting for up to 120 seated guests. The country chic décor is enhanced by modern sound and lighting systems, air conditioning/heating, solid wood flooring and French doors that open onto the peaceful courtyard. 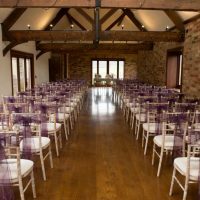 Designed to provide a calming atmosphere for the bridal party, the South Barn provides a special space for pre-wedding preparations. 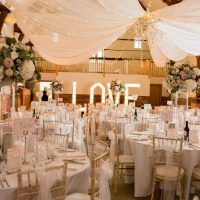 Furnished with comfortable furniture, dressing table, dress rail, mirrors and makeup lighting it makes a delightful space to get ready for your special day. Need to freshen up first thing? The ensuite shower room is equipped with Temple Spa products to fully enhance the luxurious experience. Modern conveniences include a Tassimo coffee machine and Bowers and Wilkins iPod dock. If you dream of an outdoor celebration you are spoilt for choice of settings at Long Furlong Barn. Not only is it blessed with sensational views of the rolling countryside, it also offers a quaint secret garden and courtyard and lawns. These spaces provide gorgeous backdrops for your wedding photography and are functional too; equipped with seating, outside heating and sound system. Circa Events have been the chosen caterers for Furlong Barn since 2000. However, should you fancy something a little different, there are five recommended catering companies to choose from to create the perfect menu with food that tastes every bit as good as it looks. To discuss your catering needs please contact Circa on circa@longfurlongbarn.co.uk.